We are coming up on spring school conferences for our kids. The idea behind the conference is to find out how your child is progressing in school. Usually the teacher pulls out examples of your child’s work and then talks about your child’s performance, attitude and behavior in class. However lately, I feel like a few of the teachers are letting me down with their performance. Maybe the reason my child is bored at school and not interested in certain subjects has something to do with how these particular teachers are relating to the students and engaging them. I don’t want to be a helicopter mom, but I do feel like teachers need to be accountable too. And measuring teachers with standardized tests is a joke. I believe that’s part of the problem. Since my kids started public school 8 years ago, I have slowly seen a deterioration in the student/teacher relationship. It’s not across the board. 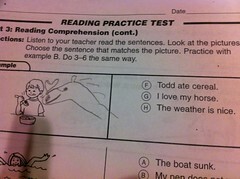 Some teachers continue to hit it out of the ballpark with their methods and approach. However, more and more teachers, in my opinion, are falling short of expectations. And teachers who were student favorites just a few short years ago seem to have lost their zest for making the classroom fun and engaging. There are several factors, I believe that contribute to this, and I’m sure it’s not just limited to our small suburban school district in Minnesota. Teachers who are frustrated with added administrative work and red tape. Some teachers are great at pushing their frustrations aside and focusing on what’s best for the kids. They are naturally warm and caring. But I think more and more are getting burned-out by all of the new mandates. And they are teaching what they are forced to teach, not what they are naturally interested in. I had an interesting talk with a girlfriend whose son, like my son is having trouble staying focused and interested in school this year. I think our impulse is to get frustrated with our kids. Why aren’t you trying harder? Why aren’t you studying more? But I have reflected more on this. While teachers are quick to blame the kids for poor performance, do they ever turn the microscope on themselves and ask if they could be doing anything better or differently? Last fall, I met with my son’s 5th grade science teacher after she mentioned that he was struggling with science. My son, who has always been described as a dream student, told us this particular teacher was not nice to him. When I met with her, I explained that this was his perception. And although it may not be true, it was how he felt. I asked her to try to reach out to him and try to connect with him. For weeks after, I asked my son if she ever said anything. According to him, she never did. When my older son was in 5th grade, just a couple of years ago, he had the best year ever. He was genuinely interested in the subjects at school. But a lot changed since my son was in 5th grade. Just last year the 6th grade moved to the junior high and teachers were switched around. This meant they were asked to teach different subjects than they are accustomed to. Teachers are faced with more hurdles than ever. They’re dealing with budget issues, no child left behind issues. It’s not easy to be a teacher nowadays. I get that. It’s probably one of the most challenging jobs around. But you still have to find a way to connect with kids!! When you can connect with a child, you motivate and inspire them. Achievement and success become easier for all parties. I am a firm believer just about anything can be interesting, if you figure out a way to present that information, as it relates to your audience. And in this case, your audience is children. And you have to ask yourself, if *x* amount of kids are not able to focus, maybe you, as the teacher, aren’t making the grade. I am going into my school conferences this week with an open mind. I am going to listen. But I also plan to ask questions. Just as the teachers have expectations of our children, we need to have expectations of our teachers. ← Can you handle the truth?? A great post: you really cover the angles and ask pertinent questions that need to be asked and that should be answered. I am a teacher (Grade 8 and 9 English) and recently I’ve been thinking a lot about the importance of likability. I used to dismiss this a bit, but now I think liking something/someone is of vital importance. For a teacher to be effective, they need to like the subject and like the age group they are teaching. Their are other aspects to effectiveness, of course, but if you don’t have these aspects of likability, they’re hard to achieve. And teacher evaluation, if done right, is essential. If it’s done wrong, there’s a much bigger problem. Thanks again for asking great questions. And you’ll notice an English teacher can make there/their errors. Sadly. 6 teaching days until Spring Break! Thanks Ironic Mom. It’s been an interesting year for us. I appreciate your feedback and insight as a teacher. Based on reading your blog, I would bet you are a fabulous teacher. You have a great sense of humor. And sometimes I believe one of the best ways to engage kids is to make the laugh. There are many passionate teachers out there and this year both our kids have incredible teachers! They both look forward to going to school. In 5th grade my son has bonded with his teacher more than any other teacher he has ever had. They have similar interests and his teacher brings out the best in my son. I don’t want 5th grade to end, he is so good. He makes school interesting and engaging with different topics and worldly studies. He does it all on his own. My son comes home daily talking about something his teacher has said to him or learned in the classroom. I think half the problem is, who are the teachers accountable to? Many don’t see their customers as students and parents. If I don’t do an incredible sales job and excede my clients expectations, I get fired. That doesn’t happen in the teaching world. You don’t meet the mark, parents complain, your students aren’t or don’t engage, you create a nonproductive classroom environment, you yell at students, you still get to keep your job. A teacher still doesn’t get fired! Rarely! So glad to hear Billy and Anna are both having a great year. I worry the way things are going, teachers are mostly measured on test scores and seniority. And I believe we need more teachers like your kids have this year. It makes such a huge difference. And how are these teachers recognized or rewarded for their outstanding efforts? It’s really great to hear such a concern come from teachers. Passionate teachers can really influence a classroom environment to achieve better results! Its actually a very simple premise. If teachers are enjoying themselves, then the students will also have fun in return. Yes, it is all about passion. My son had an incredible English teacher last year who helped him conquer his fear of writing. This teacher generously stayed after school to help my son get words to paper, when he couldn’t get past a blank page. And when I had to pick up my son early from school one day he saw us together in the hall and made sure to compliment my son. It made my son feel so good and he is so excited to have this teacher again this year. Whenever I originally commented I clicked the Notify me whenever new comments are added checkbox and currently every time a comment is added I get four messages with the exact same comment.